What Could/Should a School CAS Look Like? Home ← What Could/Should a School CAS Look Like? The use of Computer Algebra Software with senior level and high ability students offers some obvious benefits for learning, and some very real motivations for widespread adoption. It is the use of CAS in the earlier years - the years when students are actually learning algebra - that remains highly problematic. Here we consider some thoughts that have arisen from my involvement with CAS in the high school classroom over the past twenty five years and more, as both teacher and researcher. So I ponder what features might serve to make mathematics technology such as CAS more suitable for the younger and less able - not just for high flyers. An exemplar is offered which attempts to make explicit the key features discussed here. Scripted in Lua, this prototype is built upon the TI-Nspire CAS engine (although will work equally well in a numeric environment). I do not pretend to have firm answers. Rather I offer these suggestions and observations for the consideration of others. Feel free to disagree - and perhaps even to engage in discussion and debate - not with me, necessarily, but with others: those you work with, and those in the broader mathematics education communities of which you are a part. It seems to me that we still carry the burden of CAS as it was designed originally - as a tool for doing mathematics, to be used by mathematicians. What we need now is a tool for learning mathematics, which can be used by anyone. Think about the various computer algebra tools currently available for classrooms - TI-Nspire CAS, of course, Mathematica, Maple... How are they different from those early CAS like muMath, which led to Derive (which eventually led to TI-Nspire CAS)?. Essentially two things have been added to the old command-line CAS - a facility for multiple representations (addition of a graph plotter) and various attempts at interfaces which seek to supplement the old command-line syntax - largely templates and menus. Much more is needed if such tools are to be accessible and appropriate for all learners and, indeed, to become learning tools and not just mathematical tools. I begin with some fundamentals. The key issue for mathematics education is not whether to teach fundamentals but which fundamentals to teach and how to teach them. Changes in the practice of mathematics do alter the balance of priorities among the many topics that are important for numeracy. So if numeracy is a functional skill for life, then why have schools been so spectacularly unsuccessful in developing numerate students? Encourage and teach multiple strategies, both formal and informal, with an emphasis upon mental computation and flexible approaches to problems. Wherever possible, situate those problems within authentic contexts, in this way encouraging students to develop mathematical knowledge and skills which are transferable and applicable. There is no assumption that these are the only or even the most significant of dimensions related to classroom learning. They are simply relevant in the current context. Where does your classroom lie in this space? What about the typical classroom? I would suggest that what is shown here represents the "typical" mathematics classroom: teacher-centred (instruction rather than enquiry), assuming that students must learn their mathematics in isolation and unsupported, and a dominating focus upon mastery of skills rather than understanding of concepts. What is algorithm but a deliberate reduction of meaning? When we teach a step-by-step procedure to move efficiently from a starting point (question) to a conclusion (result), we actually emphasise for students NOT to stop and think about what the steps mean but rather to follow them blindly - to practise until this can be done with no reference to context. Think about adding two fractions as a prime example. While such learning may, in the short term, appear to be efficient it is almost inevitably ineffective because what is lost along the way is the ability to apply and transfer such knowledge to new or even simply unfamiliar situations. Finally, within the domain of algebra learning, the focus can be seen to be upon the syntax - the manipulation of symbols - or upon the semantics: the meaning of those symbols (variables and functions) within a particular context. The very real danger of using computer algebra tools within the learning of algebra is that such tools reward precisely what we should be seeking to minimize: a focus upon meaningless manipulation. For a CAS there is no context other than what we provide. So how does technology influence these dimensions? Consider: Technology for learning in mathematics and science serves two main functions: as a tool for representation and as a tool for manipulation. The first of these is most commonly associated with concept development and visualization; the second with skills development. Tools like spreadsheet and CAS are primarily manipulative tools; a graph plotter is clearly a tool for visualisation. Tools such as dynamic geometry systems authentically offer both dimensions and, in recent years the various mathematical tools have moved to offer elements of both - so graph plotters now may support some manipulation of the plotted form, and CAS have the symbolic form linked to graphical and numerical representations. Of course, both roles are necessary and important - they complement each other. The danger occurs when one dominates the learning situation to the exclusion of the other. Technology is never used in a vacuum. Such use always occurs within a classroom and a curricular context, and these impact heavily upon the ways in which it is used and the likely effectiveness of such use. So What Might a School CAS Look Like? It is possible to identify what might be termed a cycle of interaction which occurs between a student, the mathematics and the available tools within a learning situation (Arnold, 1996). Confronted by a problem situation (which may be formal or informal, explicit, as in a "textbook question," or implied, as in a word problem), the student must interpret the situation and recognise a mathematical object, which may be an equation, graph, symbol or perhaps a geometric figure. Failure to recognise such an object within a particular mathematical situation may not mean that no further mathematical actions can be effected. It does, however, negate the possibility of software tool use within that context, since such use requires a specific object upon which to act. This object signals mathematical action, the strength of the signal character (van Hiele, 1986, pp. 60-61) influencing the available repertoire of strategies (which may include traditional mathematical actions, such as simplifying, substituting, solving, expanding, factorising, sketching, and computer-based actions, such as graphing, tabulating or even animating). Certain forms display strong and consistent signal characters which readily lead to action on the part of participants. The action strategy produces a result which must be evaluated by the student regarding the extent to which it brings the encounter closer to a point of closure. Depending upon the classroom culture and expectations set by the teacher, this may be the end of the experience, or may lead into a new cycle of interaction in which the student evaluates the success of their method and begins a new interaction cycle. 1. Limit the Interface: The nature of the tool becomes important here. In the case of a typical computer algebra system, the student is initially confronted with their first common source of uncertainty (and often, frustration): the blank page. Assume that they have recognized a mathematical object from the problem context. They must now enter this into the technological tool. The interface here becomes critical, and can form an immediate stumbling block. I have used alegbra tiles with my students for many, many years, and found them to be powerful tools for building concrete foundations for their algebraic thinking and understanding (when used carefully and appropriately!). They serve well for linear and quadratic functions - but these are exactly the functions that are critical in the first years of algebra study. So why not use this visual and tactile approach as an input method for our CAS? Of course, you can still enter expressions and equations in the usual way, directly into the CAS page provided, but this approach seems to offer substantial promise for students to build their algegbraic objects - and then to be able to act upon them. 2. Offer Immediate Feedback on Entry: Ideally, the student should see the object in its correct mathematical form as it is being entered. For an algebraic object, this will mean superscripted indices and, ideally, correctly formatted fractions. Some tools make use of templates, allowing the user to click on the desired form and then enter the values. Most importantly, they should receive feedback so that they quickly recognize errors along the way. Clearly, command-line approaches fail to provide such feedback and are unsuitable for less able learners (probably just as unsuitable for capable students!). Indeed, such feedback can be offered, not only when entering the algebraic object, but when acting upon it in a step-by-step process, as seen next. Once the mathematical object has been entered and verified as correct, the next student stumbling block occurs - what to do with this object? 3. Limit the Available Actions: This is no small problem. Modern CAS offer a bewildering array of commands (and always have, actually). Menu after menu offer multiple options which prove confusing for many students. In the prototype shown, upon pressing the enter key, the range of available actions (limited here considerably) is further reduced to those appropriate for that particular object. The full range of actions can be accessed at any time by pressing left or right arrows, but this reduction of complexity is an important attribute of this model. Enter a standard quadratic, and the appropriate actions are limited to those shown. 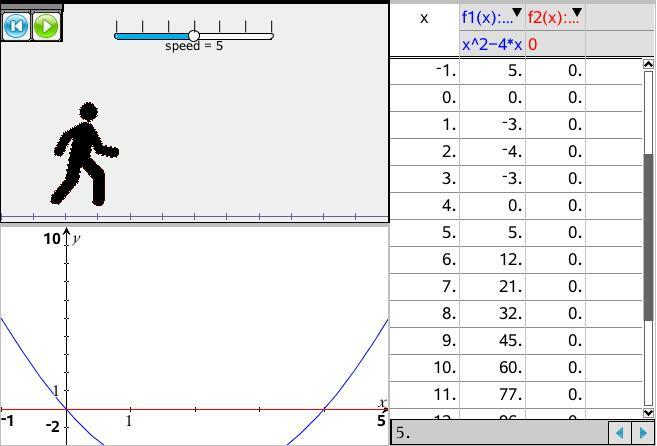 Turn the expression into an equation (by adding an "= 0" for example) and the "zeros" command becomes "solve". 4. Link the Symbolic Form with Other Representations and with "Real Language": On selecting an action, the "plain english" form is displayed - in the example shown, "Complete the Square" is displayed so that students may readily relate the object and the action. The need for the type of formal syntax assumed in most CAS (eg solve(x^2-4*x+3 = 0, x) or even Solve[x^2-4*x+3==0, x]!) places additional burdens upon the learner - and generally unnecessary burdens. The requirement to specify the variable within a simple solve command seems easily avoided. 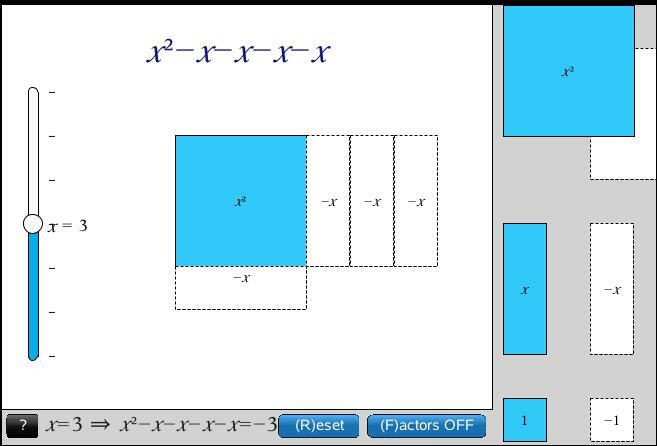 As soon as an algebraic form is entered, the graphical and tabular forms are also available on the next page. The linking of representations for early learners remains critically important, but it also must be managed carefully by the teacher. Making such forms available on the next page offers such control. Additionally, an experimental "motion explorer" is offered, linking the current function or equation to the movement of runners in a "race". Direct control over the motion is offered through grabbing and dragging the graph - changing y-intercept and gradient in particular. This adds another powerful and perhaps unexpected dimension to the students' thinking about that algebraic object. And What Might a School CAS Do? If a computer algebra tool is to be truly at home in the classroom, then it must be more than a mathematical tool - it must also be a tool for learning. Scratch the surface of any modern CAS and you find little pedagogy. Interestingly, the domain for which such tools are most naturally suited tends to be the most neglected. Enormous effort goes into using technology as an aid to concept development but little seems to be done to make such tools better as an aid for skill development. 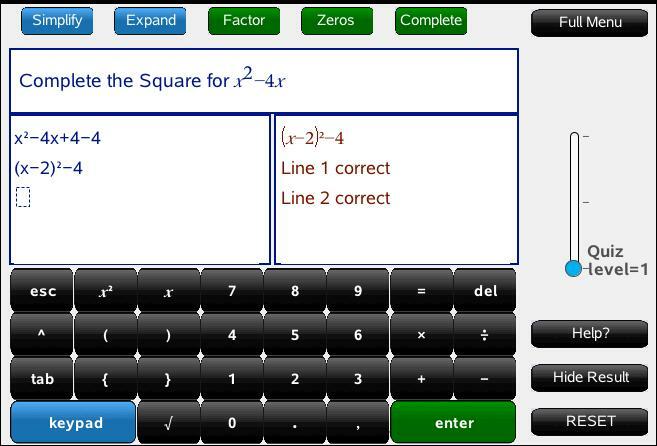 An immediate and powerful opportunity arises when students are working through step-by-step processes, such as equation solving and completing the square. The possibility for the technology to validate each step as following correctly from the previous one is a powerful tool for learning, and for building confidence. 5. Mastering Basic Skills: From the earliest days of computer use in education, teachers have written simple programs that generate questions and then provide feedback as the student works through the answering process. It might be simple programming and even simpler pedagogy, but it remains useful as an aid to students learning to master the basic skills that are still required (usually for assessment). While we might question the long term importance of such methods, they remain significant aspects of classroom learning, and our technological tools can provide patient and repeated practise for learners. Conceptual understanding is critically important in the learning of mathematics, but it is not the whole story. The mastery of skills remains an essential part of the learning process, and not only because of the value placed upon such skills by most high-stakes assessment. True learning has not occurred until students can give back what they have learned. Since CAS arises from the needs of "working mathematicians" rather than from pedagogy, the focus tends to be upon delivering a result in the most expedient way: input -> output. CAS represents the ultimate "black box". Consideration needs to be given to supporting students through algebraic processes, usually in a step-by-step way. Such an approach can be either static or interactive. It would seem likely that an approach that involved the student as active participant rather than spectator will be far more effective. 6. Laying Concrete Foundations for Algebraic Thinking: If we are truly considering the development of a computer algebra system specifically aimed at high school classrooms and viable for the learning of algebra, then we should also consider the key danger associated with the use of symbolic manipulation in schools: the main problem with our teaching of algebra up to this point has been the focus upon the symbolic manipulation (the syntax) at the expense of the meaning behind the symbols (the semantics). Technology offers some unique opportunities in this regard, particularly through dynamic linking between the symbolic representation and geometric counterparts (consider some of the early TI-Nspire activities - the Falling Ladder, the PaperFold, the Beach Race. These powerful learning devices drew strong connections between the geometric, the graphical and the symbolic forms and offered powerful tools for building, not just algebraic facility, but algebraic understanding). As mentioned above, similarly powerful has been the growing body of work devoted to dynamic "algebra tiles" which explicitly support the development of symbolic understanding and manipulative skill within a concrete framework. If we are to consider a CAS that is ideally positioned for use across the high school years, then this MUST explicitly support the link between the symbolic representation and geometric and graphical forms. Some form of dynamic algebra tile facility would seem to be highly recommended for this context. Geometry underpins so much of our algebraic thinking. Imagine if relationships between symbols and variables can be derived from geometric constructions that arise from authentic contexts! Once again, the opportunity for real language to be used for variables and functions is a powerful aid to understanding and deep learning. At the heart of what we are attempting here is to achieve that ultimate educational goal: deep learning. To assist our students to move beyond rote learning and surface understanding, even beyond the engagement which is quickly recognized as an essential ingredient. It is not enough that our students be busy - they need to be cognitively active as well - making sense of what they do, drawing connections and, eventually, conclusions that will support them to learn mathematics which is both applicable to their needs, and transferable to new and future contexts. Computer algebra can be an important tool in both our mathematical and pedagogical toolboxes but, like any powerful tool, it must be used with care. Like any powerful tool, misuse can result in harmful consequences. A well-designed CAS would prove a partner for teachers and students in the learning of that most challenging domain of mathematics: algebra. Arnold, S. M. (1996). Learning to use new tools: A study of mathematical software use for the learning of algebra Unpublished doctoral dissertation, University of New South Wales. Valsiner, J. (1984). Construction of the zone of proximal development in adult-child joint action: The socialization of meals. In B. Rogoff and J. V. Wertsch (Eds. ), Children's learning in the zone of proximal development. New directions for child development, No. 23. San Francisco: Jossey-Bass. Van Hiele, P. (1986). Structure and insight: A theory of mathematics education. Orlando, FA: Academic Press. Wood, D. J. (1986). Aspects of teaching and learning. In M. Richards and P. Light (Ed. ), Children of social worlds: Development in a social context. Cambridge, MA: Harvard University Press. 191-212.